The International Red Cross (ICRC) takes hand at pro-Arab propaganda The ICRC has turned the international community against Israel  unfortunately, without a significant response from the prime minister. According to the International Committee of the Red Cross's Anton Camen ("Why the law prohibits settlement activities," May 27) Israeli presence in and control of Judea and Samaria are illegal. But what is "the law" to which he refers? Camen says the law defining and governing occupation is the Hague Regulation (1907). He writes that "the law of occupation... is defined by Article 42 of the Hague Regulations...."
That's a half-truth. Article 42, Section III, Military Authority Over The Territory Of The Hostile State, states: "Territory is considered occupied when it is actually placed under the authority of the hostile army. The occupation extends only to the territory where such authority has been established and can be exercised." The title of this section, however, refers to territory belonging legitimately to a sovereign state; that was not the case in 1967. Moreover, Camen ignores Article 43, which states: "The authority of the legitimate power having in fact passed into the hands of the occupant, the latter shall take all the measures in his power to restore, and ensure, as far as possible, public order and safety, while respecting, unless absolutely prevented, the laws in force in the country." This means that "occupation" occurs when the "legitimate power" of one country is usurped by another. Since Jordan's invasion and occupation was not legitimate, Israel's acquisition of Judea, Samaria, and eastern Jerusalem in 1967 cannot be considered illegal. The ICRC, however, differs  and here is the problem. 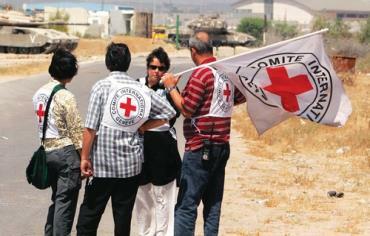 The ICRC decided unilaterally and behind closed doors that Israel had violated the Fourth Geneva Convention (FGC). They made that "the law," as if nothing preceded Jordan's illegal conquering of the area which was renamed the "West Bank." By what right did the ICRC decide unilaterally and arbitrarily that Israel had "violated international law?" Why are a few anonymous Swiss citizens working for the ICRC accepted as the sole authority to decide what is "the law?" And, on what basis did the ICRC decide that Israel is guilty? "The law," according to the ICRC, ignores the San Remo Resolutions and League of Nations Mandate which was  and remains  "international law." It states: "The Mandatory shall be responsible for placing the country [Palestine] under such political, administrative and economic conditions as will secure the establishment of the Jewish National Home...."
The ICRC has never explained why its interpretation of international law and FGC trumps all others. Nor has it explained why it has designated  again unilaterally  Judea and Samaria as "occupied Palestinian territory." Camen adds: " ...the prohibition of settlement activities by an occupying power" is "enshrined" in the FGC. This is utter nonsense. The FGC does not mention settlements. Camen then invokes the Hague Regulations of 1907 to accuse Israel of "illegal occupation." These regulations refer to occupation occurring only between states, and, of course, don't mention "settlements." Using it to condemn Jews who live in Judea and Samaria is an ICRC invention. Even more absurdly, Camen then asserts that "settlement activities are incompatible with... [the] International Law of Occupation..." which the ICRC developed and uses to condemn Israel. The ICRC has never applied it to any other "disputed territory." Because the ICRC has official "observer" status at the UN and is affiliated with most other international organizations, its decisions are considered authoritative  and are therefore unquestioned. Having defined what "the law" is  a special law that applies only to Israel and to Jews  the ICRC then condemns Israel for violating it. The ICRC has turned the international community against Israel  unfortunately, without a significant response from the prime minister. A spokesman for his office was unable to provide a statement refuting the ICRC's position by print time. The primary obligation of the prime minister and the government is to defend our national interests and state the truth: accusing Israel of "violating the law" is a canard. The ICRC is responsible for perpetrating it; the Israeli government is culpable for allowing it to continue. The Edmond Levy Report dealt thoroughly with this question, but Prime Minister Binyamin Netanyahu refuses to accept it  thereby empowering the challenge to Israel. Why is he silent?